As the days begin to grow colder, one of the most tactile pleasures is wearing a short scarf at the neck. 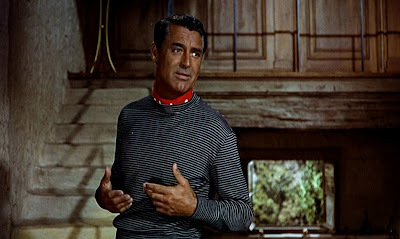 I’ve never taken to wearing an ascot in an open shirt collar, much as I agree with the rationale of retaining some silk at the neck; perhaps there are just too many negative associations. But I do like wearing a silk or silk mix scarf with a crewneck sweater. This can be any size and shape, as long as it is not too big, but my favourites are 90cm and 70cm squares from the likes of Hermès and Arnys. Now I’m not going to spend several instructional paragraphs explaining how to knot the scarves. Other sites do that far better with diagrams and even video (and I will link to them where appropriate). What I am going to do is relay my personal experience and advice. The condensed lessons of several years of experimentation should hopefully be of some use. Three ways of tying the scarf are shown here: the simple tie knot, the square knot and the basic Ascot. With a square piece of cloth, all begin with folding in two opposing corners and then repeating from the same sides, until you have a long strip to work with. The square knot, shown at top, and just above before tucking it into the sweater, produces a satisfyingly clean finish not dissimilar to the bow tie (as the technique is similar). 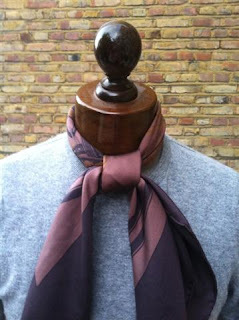 However, the knot is rather large and – with a scarf this size – can sit a little awkwardly above or below the neckline. The finish is neater with a smaller piece of silk, say a large handkerchief. Unlike the two other options, the square knot’s loose ends flow sideways and not down. 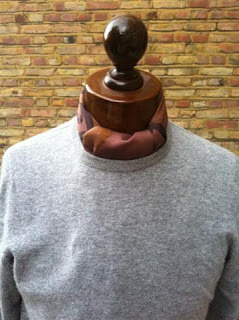 An alternative, therefore, is to secure those two ends behind the neck with a simple knot (or a neck ring) – above. Good for a particularly cold day but perhaps a little bulky. The second option is the simple tie knot (also known as the oriental knot, or a slip knot). Unlike a four in hand, this involves one less layer of silk by virtue of starting with the underside of the tie uppermost. I wouldn’t recommend it for a normal tie – too little body – but it can be useful for a scarf where reducing the silk in the knot is a priority. This option produces a triangular knot, which is less bulky that the square knot. 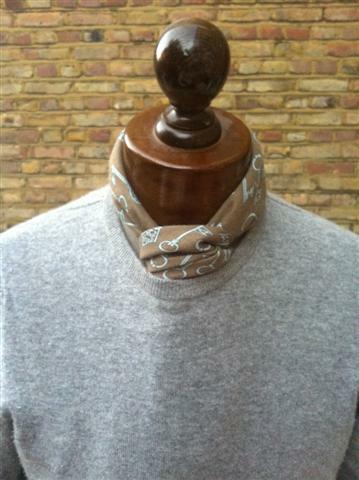 Although some may dislike it aesthetically, it is functional and folds easily under the neckline. 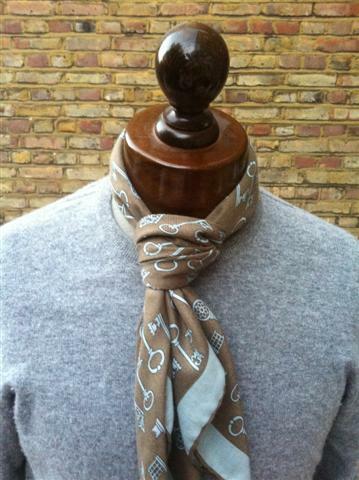 It is also secure, which is the major advantage over the next option – the Ascot knot. This is the familiar method for tying any scarf, pulling the end of a straightforward knot up and away from the chin, before spreading it to create a broad front blade. 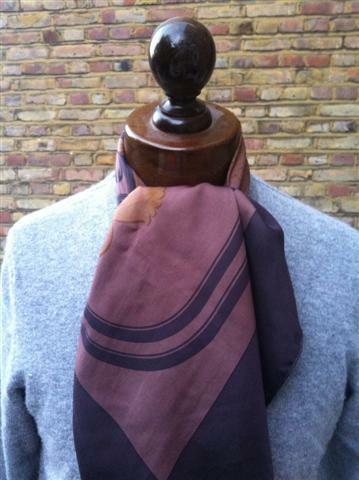 Because there is no real knot here, more of a fold, the front is soft and folds under easily. 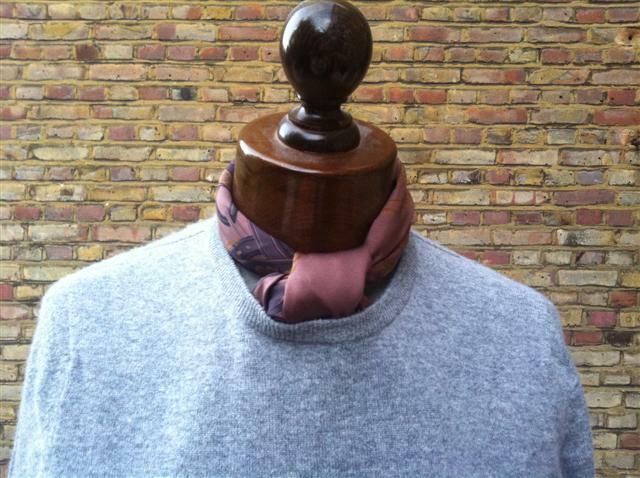 However, any vigorous activity can dislodge it (including picking up and putting down my one-year-old, which I do too many times a day to count), which is doubtless why it works best in the open neck of a shirt or with a woollen full scarf. I’d recommend it as dressy option, but you could end up retying it several times during the day. Go and wear a scarf to keep out the chill. You can follow the discussion on How to wear a silk scarf by entering your email address in the box below. You will then receive an email every time a new comment is added. These will also contain a link to a page where you can stop the alerts, and remove all of your related data from the site. What are your feelings on wearing a neckerscarf with a V-neck sweater? Or is that only done with a crewneck? It is certainly done with a V-neck, and there is nothing necessarily wrong with it. Stylistically, however, I prefer it with a crew neck. 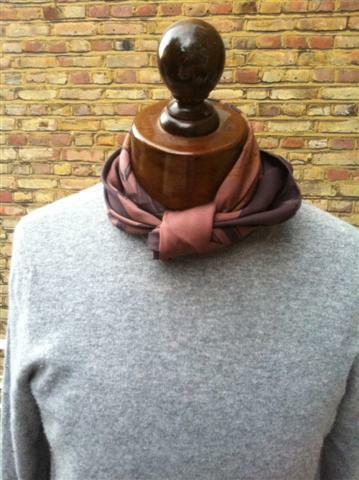 Perhaps it looks more practical, or just has less in common with an ascot. Those sweaters with a higher v-neck work well, though are perhaps less classic, as in the photo of Mr. Grant. I’m tucking this post away for now because the weather’s still nice. I’m in the North – in the Netherlands – and we’re having an Indian Summer! Could you please explain the “folding in two opposing corners and then repeating from the same sides” part?